I realized I had a problem when I put on the glasses of a 74-year-old woman; six years later, I can see clearly, thanks to technology and Bobby McFerrin. My mother, her oldest sister and I were heading to lunch at a restaurant named for the county I grew up in, and my aunt was giving directions. These aren’t mine, but I hated the thought of wearing glasses. Sadly, I could not read the street names, but I could tell the difference between a street with a long name and one with a short one. When I put on those glasses, I could actually read the names of the streets. I knew then I needed my eyes checked, as my vision had apparently been blurry for a while. How did I become someone with nearsightedness, an astigmatism and presbyopia? First, regular glasses. 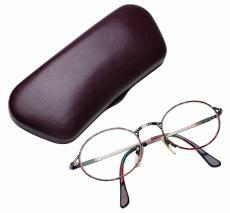 Then, progressive lenses so I didn’t look older than I felt by wearing visible bifocals. Every year, the prescription got stronger and stronger. Each year, I grew to hate being dependent on glasses. Then, while at work, I had a conversation with someone who mentioned he had had LASIK surgery on both eyes, had 20/20 vision and no longer wore glasses to see things at a distance. He did say he had to wear them for reading, however. Then, the week before my surgery, I talked with another guy who had had the surgery just days before at the same place. His vision went from 20/300 (and wore those really thick glasses) to 20/30 without glasses. He said the surgery was the third best thing he had done in his life, behind getting married and going to Africa. I was convinced I was doing the right thing, and then I read the patient information booklet the doctor had given me. During the first procedure, my vision could go blurry, or I could lose it? Then, I saw the word “temporarily.” Whew! Other concerns were that if something went bad in one eye, it could happen in the other. One reason to have the procedure on one eye at a time. I had scheduled the procedure for my right eye only, as my reading vision is still decent. I just wanted to drive and watch movies without glasses. On the day of the 8:45 a.m. procedure, I had my ride drop me off early and told him to come back around 11 to get me. The literature had said to expect to be in the office two hours. In the office, the doctor asked if I had any questions. I had already read the procedure is painless, requires no stitches and has immediate results. He explained that the procedure had two parts, the first for cutting a flap on the cornea, the second for correcting the vision. He also explained my other main concern: What if I blinked? My eyeball is fitted with a contraption that prevents blinking. When we got into the procedure room, an assistant put numbing drops in my eyes, and I quickly reminded him I was having surgery only on one eye. He said the numbing of both prevents sympathetic reaction from the other eye and then put a patch over my left eye. I never heard the end of the song; the procedure was just that quick. First came the suction and burning smell of the laser flap-cutter as the doctor told me I was doing fine. Then, I walked over to the other machine, where, from my perspective, the procedure looked like I was in my car while going in a drive-through car wash.
Lots of water and a squeegee cleaning it off. At 9:15, back in the lobby, I called my ride. As I rode home, I read the billboards. Who reads billboards? I felt like a child on Christmas morning. That night, I watched TV without glasses. Three months later, I still see clearly. If you’re tired of glasses, consider LASIK. I chose LASIKPlus because both guys raved about it and because the doctor has done lots of these surgeries.